Welcome to Flawed yet Functional! 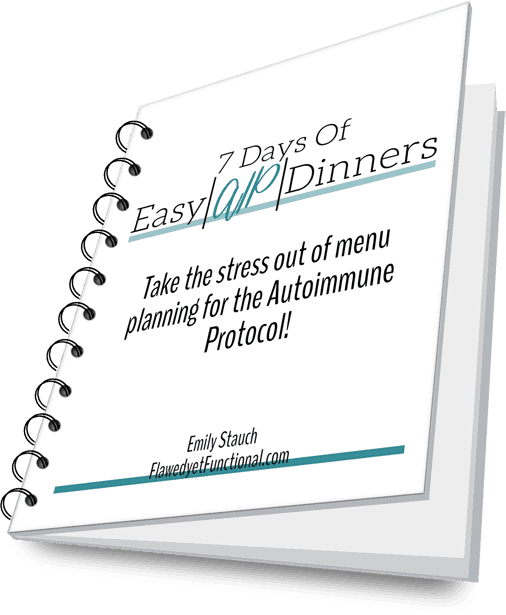 I am an insulin-free Type 1 Diabetic currently working through the reintroduction phase of the Autoimmune Protocol. 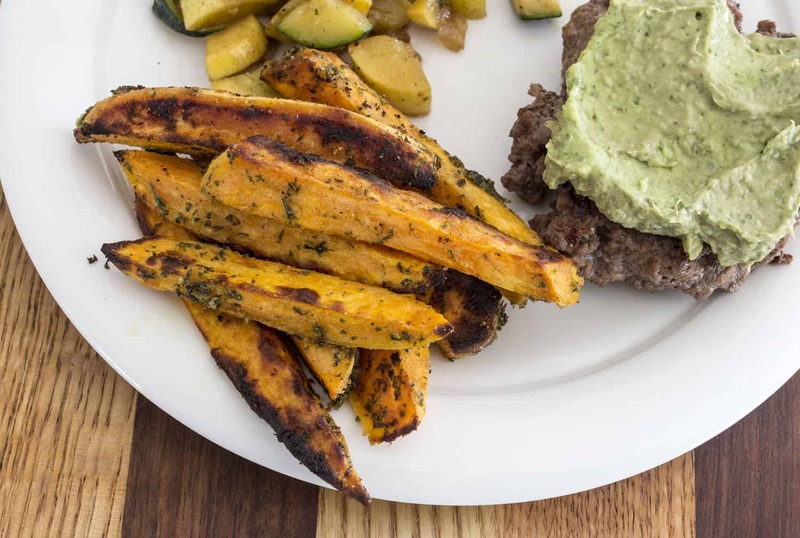 Sweet potatoes are a mainstay in my AIP Paleo diet, and I’ve made them many different ways. 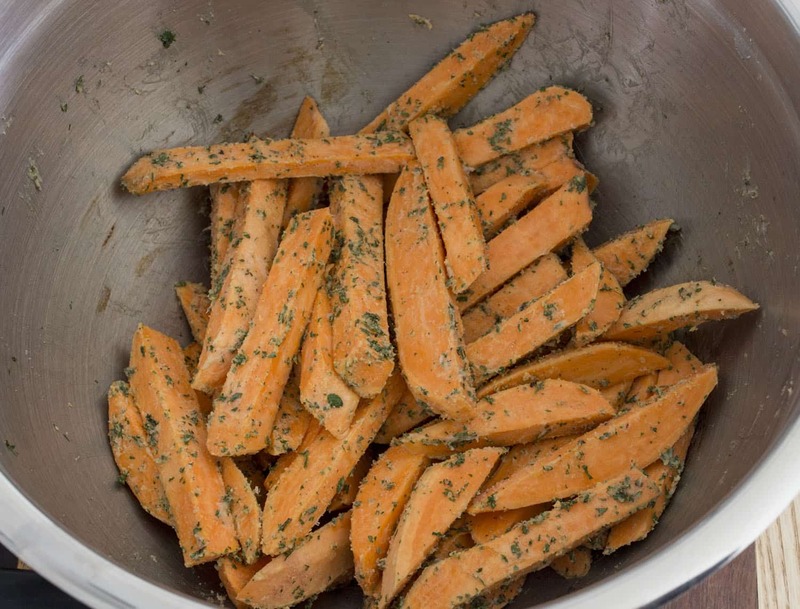 Today I’d like to share a favorite recipe of my family’s: Garlic & Onion Sweet Potato Fries. So I eat a lot of sweet potatoes. A lot. My last grocery shopping trip (to feed a family of four for two weeks) included purchasing 21 pounds of sweet potatoes. Ha, 21 pounds! It’s funny to me that I used to think sweet potatoes only appeared at Thanksgiving and now they make a daily appearance on my plate! Roasting is the most flavorful way to eat just about any vegetable. The intense heat of the oven really brings out the best in veggies. Toss on some seasoning if you want to amp up the flavor. I’ve experimented with a variety of seasoning combinations, and truly, most anything is delicious on a sweet potato. Garlic and onion together are a winning combination in my book. They go together like peanut butter and jelly! Besides roasting and the spices, another key to this killer recipe is bacon grease. Instead of using olive oil or coconut oil (very acceptable if you don’t have bacon grease on hand though! 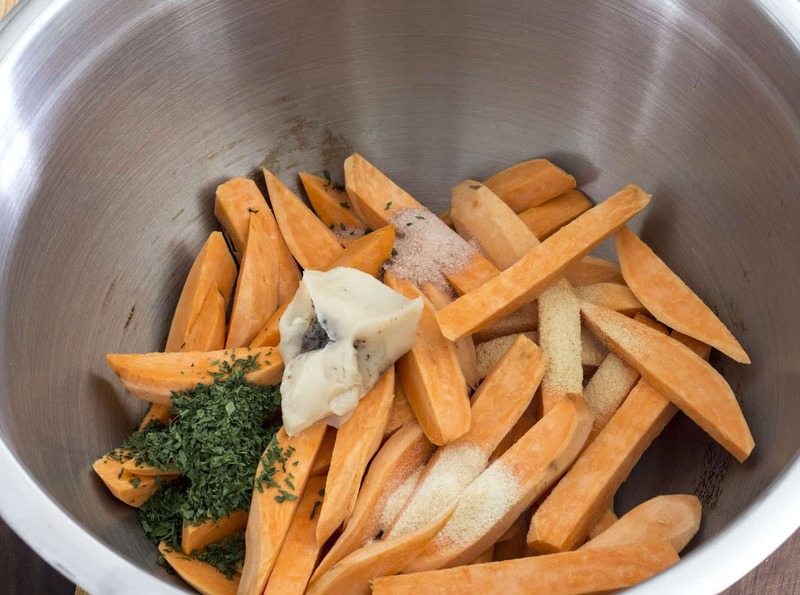 ), use a couple tablespoons of bacon grease to coat the fries and help the seasoning stick to the sweet potatoes. I pour any bacon grease into a mason jar after I cook bacon so I usually have it on hand. The bacon grease should be soft, so just toss the spices and grease on the potatoes then stir with a wooden spoon. Keep mixing until the fries are evenly coated. 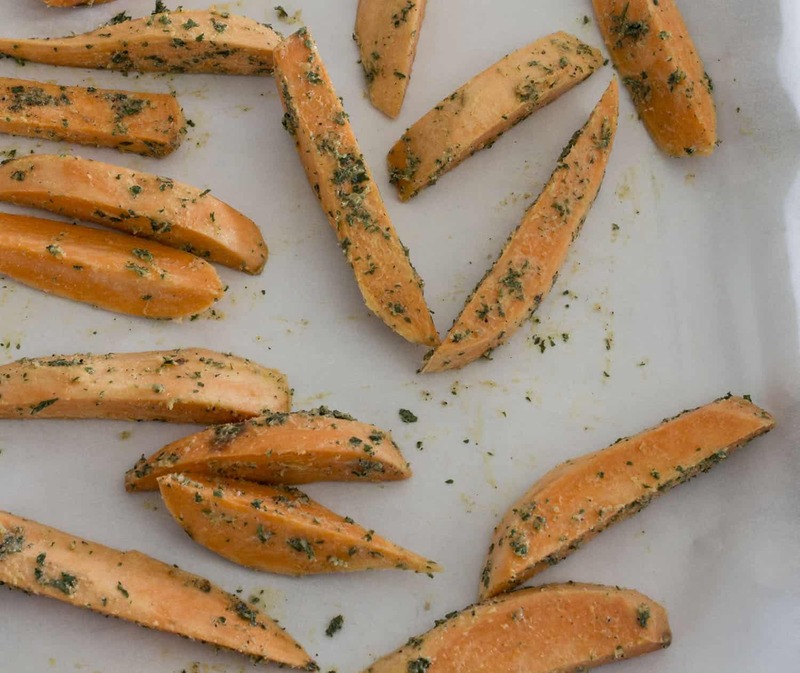 One final note for success: spread the fries out in a single layer on the lined baking sheet. A single layer is key for quick, even cooking. I usually have two pans of these when I make them, and I find them cook just fine using both the top and bottom rack of them oven. Hands down, my favorite way to eat sweet potatoes is roasted. Slicing them in these uniform 1/2″ sticks allows for quick, even cooking with a lot of surface area for crisping. I roast them for about 15 minutes at 425° then put them under the broiler to add more color and crisp. Don’t be afraid of a little black! That’s delicious char right there! I usually make enough of these fries to eat as leftover for breakfast or lunch the next day. 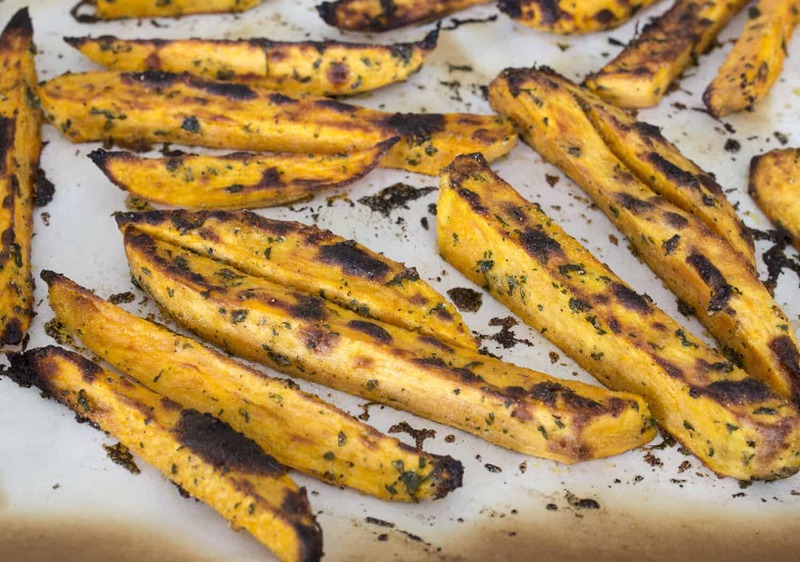 To reheat, place the sweet potato fries on a baking sheet lined with parchment paper. Place under broiler and cook for a few minutes, watching carefully so they don’t burn! Flip the fries over and broil for another 1-3 minutes. The fries will be good as new! A much better texture than if they were reheated in the microwave. Garlic & Onion fries are delicious plain or serve them with Avocado Mayo (AIP friendly) or Chipotle Mayo (Paleo friendly). Enjoy! Preheat oven to 425°. Line a rimmed baking sheet with parchment paper, set aside. Peel sweet potatoes and cut into 1/2" fries, about 3 inches long. Place sweet potatoes in a large bowl and add remaining ingredients: bacon grease, garlic powder, onion powder, parsley, salt, and pepper. Stir the sweet potatoes until all the fries are evenly covered in bacon grease and spices. 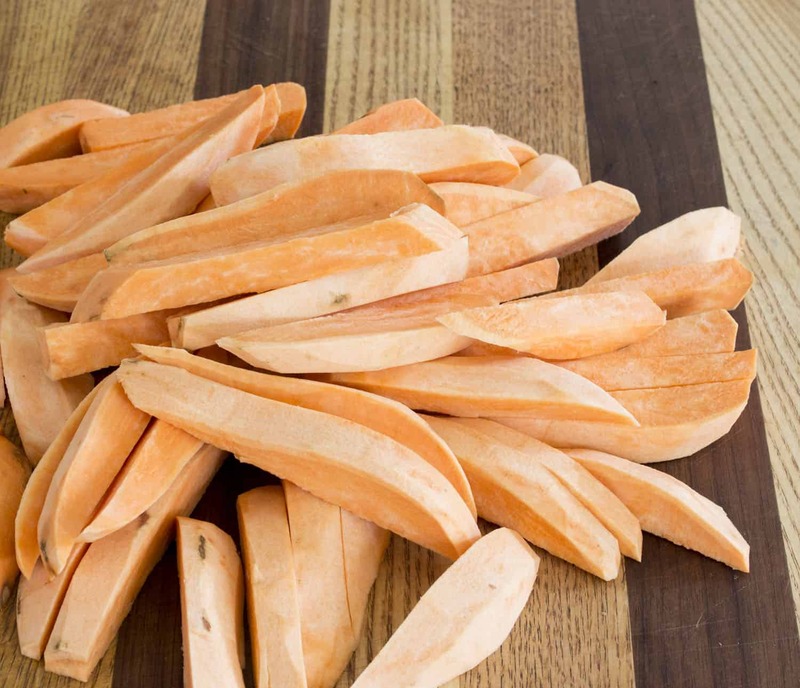 Spread sweet potatoes on lined baking sheet, leaving space between the fries. Use a second baking sheet if necessary. With rack in top 1/3 of the oven, bake at 425° for 15 minutes. Turn on broiler and broil for 3-6 minutes or until desired crisp and color. This recipe has 25g of carbohydrates per serving.